Hi everyone. Despite being under the weather, we did manage to pick up quite a few goodies this week. Actually, our biggest windfall was at 2 estate sales. One of them had an immense amount of pottery and ceramics at fairly reasonable prices. We had to hold back, because many of them were extremely large plates or planters. We've been extremelly challenged for storage space lately, so we try not to pick up big things unless they have significant value. I'm going to have to make this short, because we're still participating in the ReSeller listing challenge for February, and we've got only one day to go! OK, here we go: picked up a nice older Hitachi radio from the late 70s. That one's pretty cool because the speakers fold out from the body. They had a ton of other radios there, but I didn't know anything about them so I had to pass. The big 30s-40s art pottery flower bowl is from Winfield Pottery in Pasadena and was a great score. This is one of those gigantic heavy items that I ordinarily wouldn't have purchased, but I knew it had enough value (a previous seller had an old price tag on it ... he was trying to sell it for $500!). So I lugged it around with me for the whole hour I was at the sale. The rest of the items shown would probably qualify as "smalls" - increasingly, if I have a choice I'll always pick a small item over a big item. They're just so much easier to deal with. 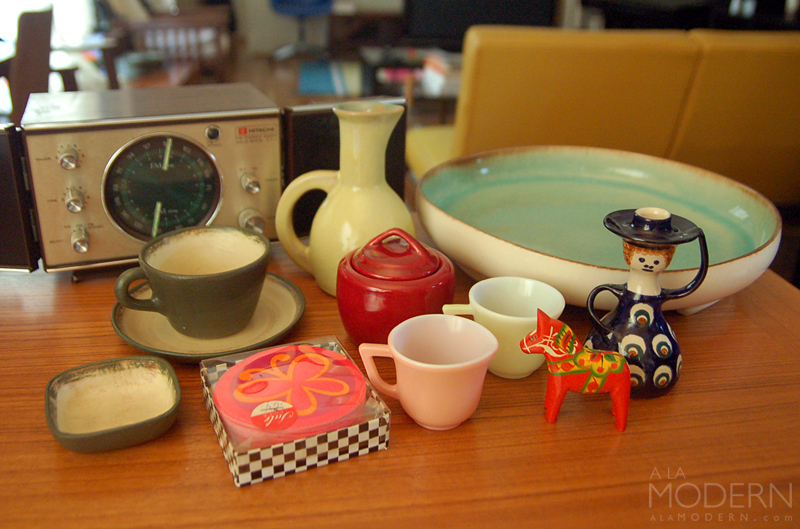 The green cup, saucer and small tray are also Winfield pieces. These are from the later "Gabriel" era - but are still really nice and handmade. We still haven't cobbled together a gallery for Winfield on Potteries of California, but hoping to get around to that soon. The little red sugar bowl is likely from another California pottery - the dark red color reminds me of Bauer, but that top handle shape is not familiar. Vernon and Metlox are also candidates. The Hazel Atlas pink creamer and yellow cups are from their "20th Century" line of the 50s - believe this was meant to be part of a child's tea set. The little Swedish Dala horse is a Grannas Olsson piece. There were quite a few more of these but I ended up not getting them because they had too much wear. Lastly, the curious candleholder lady who's holding onto her hat is a bit of a mystery. I know I've seen this German candleholder before, but can't quite place it. Anyone know? OK, going to get back to listing. Hope you all have great luck thrifting this coming week!